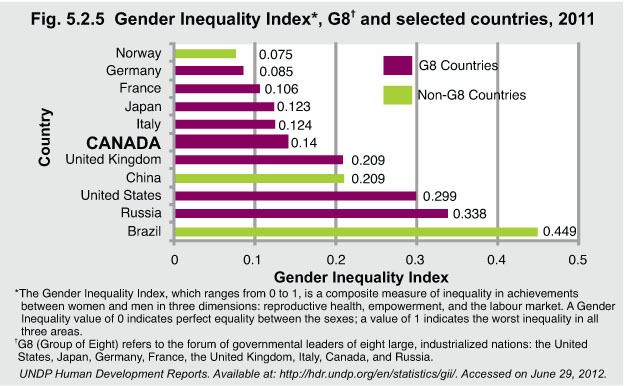 Among the G8 countries, Canada has a lower Gender Inequality Index value than the United States, Russia, and the United Kingdom but higher than Germany, Japan, France, and Italy. For 2011, Canada ranks favourably on a worldwide basis. For 2011, some countries had values above 0.6, such as Afghanistan with a value of 0.707 and the Congo at 0.710. Canada ranked 19th out of 146 countries for which there are values for 2011.